A talk box or talkbox is an effects unit that allows musicians to modify the sound of a musical instrument by shaping the frequency content of the sound and to apply speech sounds (in the same way as singing) onto the sounds of the instrument. Typically, a talk box directs sound from the instrument into the musician's mouth by means of a plastic tube adjacent to their vocal microphone. 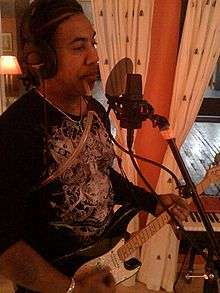 The musician controls the modification of the instrument's sound by changing the shape of the mouth, "vocalizing" the instrument's output into a microphone. Another early voice effect using the same principle of the throat as a filter was the Sonovox, invented by Gilbert Wright in 1939. Instead of a throat microphone modulating a guitar signal, it used small loudspeakers attached to the performer's throat. It was used in films such as A Letter to Three Wives (1949), Possessed (1947), The Secret Life of Walter Mitty (1947), The Good Humor Man (1950), the voice of Casey Junior the train in Dumbo (1941) and The Reluctant Dragon (1941), the instruments in Rusty in Orchestraville, the piano in Sparky's Magic Piano, and the airplane in Whizzer The Talking Airplane (1947). The Sonovox was also used in many radio station IDs produced by PAMS of Dallas and JAM Creative Productions. Lucille Ball made one of her earliest film appearances during the 1930s in a Pathé Newsreel demonstrating the Sonovox. The Sonovox was commercialized by the Wright-Sonovox company, an affiliate of the Free & Peters advertising agency. The Sonovox makes an even earlier appearance in the 1940 film You'll Find Out starring Kay Kyser and his orchestra, Bela Lugosi, Boris Karloff, and Peter Lorre. Lugosi uses the Sonovox to portray the voice of a dead person during a seance. The first use in music was a score by Ernst Toch in the Paramount Picture "The Ghost Breakers", in June 1940. British rock band The Who included a cut on their album, The Who Sell Out, that consisted of the days of the week "spoken" by guitar chords using the Sonovox. These were in fact a standard set of Sonovox cuts sold by PAMS of Dallas. It also appears in use for a short time at the end of their Quadrophenia album in "The Rock" track. The first high-powered Talk Box was developed by Bob Heil but there is clearly prior art in the form of the Kustom Electronics device, "The Bag", referenced above. Heil came up with the first high-powered Talk Box that could be reliable when used on high-level rock stages. His first Heil Talk Box was built for Joe Walsh's Barnstorm tour. Heil and Walsh both avid ham radio experimenters (K9EID and WB6ACU), along with Walsh's guitar tech "Krinkle" combined a 250-watt JBL driver and suitable hi-pass filter which was used for Walsh's single "Rocky Mountain Way". Walsh gives credit to Bill West, an electrical engineer, Nashville steel guitarist and first husband of country music legend Dottie West, for inventing the talk box for him in the May 2012 issue of Guitar World magazine. Pete Townshend, in his 2012 autobiography Who I Am, claimed to have invented a version of the Talk Box during a Who tour of the USA in 1976. "I built a speaker in a small box, attached a tube and put the tube in my mouth, allowing me to speak music." Townshend did not specify if his version was for guitar or only for music. 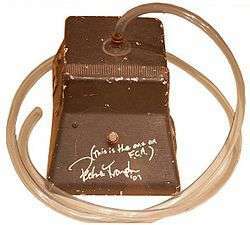 In 1972 Todd Rundgren used a Talk Box on the album Something/Anything? on the instrumental track, "Breathless". Over a synthesized background his VCS3 synthesizer repeatedly "sings" the words "I am so breathless", which can be taken as a reference to the Talk Box. In 1975, Nazareth lead singer Dan McCafferty used a talk box in the popular single "Hair of the Dog". In 1975, Aerosmith guitarist Joe Perry used a talk box in the band's highly popular singles "Sweet Emotion" and "Walk This Way", both off the album Toys in the Attic. He also used it in the theme song from the Spider-Man 90's cartoon. In 1976, Steely Dan guitarist Walter Becker recorded the talk box effect atop an already-recorded Dean Parks solo in "Haitian Divorce", on the album The Royal Scam. It was also used in a solo section of "East St. Louis Toodle-Oo", on Steely Dan's 1974 album Pretzel Logic. Ronnie Montrose used a talk box on the title track from his 1976 album "Jump On It". Also in 1976, the band Ruby (featuring Tom Fogerty) used a talk box on the track "Running Back To Me". David Gilmour of Pink Floyd used the talk box on "Pigs (Three Different Ones)" from their 1977 Animals album, and on "Keep Talking" from 1994's The Division Bell. The band Stillwater used a talkbox on their song "Mind Bender" in 1977. Also from 1977, the Meters used one on their track "Funkify Your Life". Roger Troutman, lead singer of the R&B group Zapp, used the talk box on the group's first hit single in 1980, "More Bounce to the Ounce", and in numerous other songs including Tupac Shakur's "California Love". Bon Jovi guitarist Richie Sambora used the Heil Talk box in many of the band's songs, including 1986's "Livin' on a Prayer" from Slippery When Wet, 2000's "It's My Life" from Crush, 2002's "Everyday" from Bounce, 2007's "We Got it Goin' On" (Lost Highway) and 2009's "Bullet" (The Circle). Lead guitarist Slash of the hard rock band Guns N' Roses used a talk box in "Anything Goes" off their album Appetite for Destruction, released in 1987, and in "Dust and Bones", from their following record, Use Your Illusion I. Mötley Crüe's Mick Mars used a talk box in "Kickstart My Heart" off their 1989 release, Dr. Feelgood. ↑ Fortner, Stephen (2011-05-01). "How It Works: TALKBOX 101". Keyboard (magazine). Retrieved 2016-11-24. ↑ Jamieson, Ali (2015-03-03). "Talking Synths: Using Vocoders and Talkboxes in your DAW". Retrieved 2016-11-24. ↑ Letter from Gilbert Wright to Melville Clark, April 28, 1940. ↑ McCulley, Jerry. "Rare Video – Jeff Beck Plays His '54 Oxblood Les Paul With Upp". Gibson.com. Gibson Guitar Corporation. Retrieved 2 May 2014. ↑ Green, Douglas. "Pete Drake: everyone's favorite"
↑ "Peter Frampton & Bob Heil Reunite, Talk Past, Present & Future". ProSoundWeb. July 24, 2009. Retrieved January 21, 2011. ↑ "Steely Dan Interview - Against All Odds | Guitar.com". www.guitar.com. Retrieved 2016-09-19.